This week in Veg: the last delivery of the Summer CSA. | ReLocavore: Redefining "local"
This week in Veg: the last delivery of the Summer CSA. This is the last week of vegetables from Cedar Circle. In the fall, Cedar Circle transitions to a pick up CSA model, where we would have to drive up to their farm every other week to pick up our vegetables. 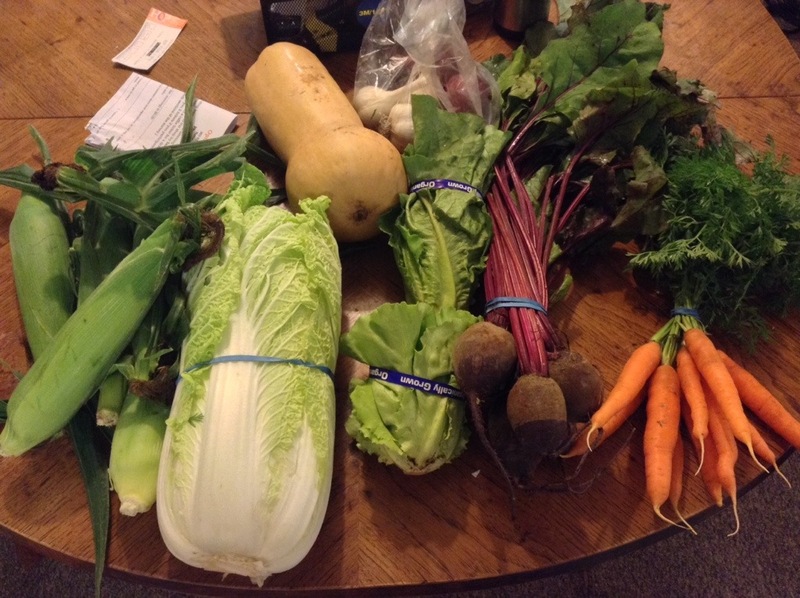 We decided the extra driving lessons so worth it, so we signed up with a different CSA for the fall/winter share. I’m surprised to see we continue to get corn from the farm. There’s also a tiny little head of butter crisp lettuce, which I love to make into Thai style lettuce wraps. Categories: Farms and Markets, This Week in Veg | Tags: beets, butternut squash, carrots, corn, csa, Farm, garlic, lettuce, local foods, local vegetables, napa cabbage, new hampshire, onions, vermont | Permalink.